MALVERN, PA. AND HACKENSACK, N.J., JUNE 27, 2013�-- MALVERN, Pa.�and HACKENSACK, N.J., June 27, 2013 /PRNewswire/ --�As part of its ongoing commitment to empowering the remote workforce,�Ricoh Americas Corporation�has teamed with�Vidyo, Inc.�and today announced the general availability of the�P3000 Unified Communication System, a business-class videoconferencing device that seamlessly integrates voice, video and data sharing with the portability of a small laptop, which will be offered by Ricoh in the United States. To complement this powerful device, Ricoh unveiled its�Unified Communication System Apps, enabled by Vidyo's APIs. This software application (free download) is priced at a reasonable monthly subscription fee for Windows computers and iPad��devices that give users the same secure, encrypted videoconferencing capabilities of the P3000 without the hardware. As with the P3000, resolution and frame rate are automatically controlled based on network load for smooth, stress-free communication. Users can now quickly and easily initiate a real-time video and audio conferencing session via the cloud, from wherever they are, including the home office, traditional office, conference room or airport. "Our�research�has shown that people who want to work outside the office fear they will lose connection with their organizations and become irrelevant," said Matt Sakauchi, Vice President, Visual Communications Group, Ricoh Americas Corporation. "The P3000 and the Unified Communication System Apps close this gap between the worker and the organization, giving workers and other participants the business-quality, face-to-face experience they want - anywhere at any time." 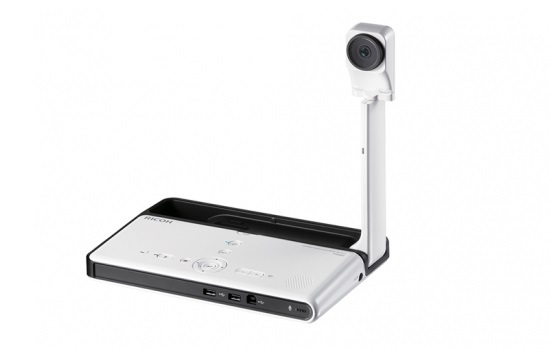 Built on the VidyoWorks platform�The P3000 and software applications, initially offered in Japan, are the first Ricoh products resulting from a partnership with videoconferencing company Vidyo as part of Ricoh's entry into the unified communications market. Now available in the United States, the P3000 is built on Vidyo's patented H.264 scalable video coding architecture which delivers unmatched telepresence-quality video conferencing over the Internet, 4G and LTE networks. The VidyoWorks� platform at the heart of the cloud-based service that powers the P3000 leverages Vidyo's patented VidyoRouter� architecture, eliminating the need for a multipoint control unit (MCU). It offers unprecedented error resiliency, low latency and rate matching. These strengths combine to provide a natural, affordable, high-quality video experience. "The P3000 is a game-changing product and is a perfect example of how our VidyoWorks platform can simplify enterprise grade business communications and workflow," said Ofer Shapiro, CEO and co-founder of Vidyo. "This innovative service is another example of how our platform can drive industry changing cloud-based services and open new markets previously not addressed by legacy video conferencing solutions." The P3000 Unified Communication System is available today through Ricoh's direct sales force for a manufacturer's suggested retail price of $2,200 (USD), plus a monthly subscription to a cloud service. The Ricoh Unified Communication System Apps, available for Windows�here�and iPad at the iTunes Store�, are included with the paid monthly subscription. For details on Ricoh's full line of products, services and solutions, please visit�www.ricoh-usa.com. About�Ricoh�Ricoh is a global technology company specializing in office imaging equipment, production print solutions, document management systems and IT services. Headquartered in Tokyo, Ricoh Group operates in about 200 countries and regions. In the financial year ending March 2013, Ricoh Group had worldwide sales of 1,924 billion yen (approx. 20 billion USD). Under its corporate tagline,�imagine. change., Ricoh helps companies transform the way they work and harness the collective imagination of their employees. For further information, please visit�www.ricoh.com/about/. � 2013 Ricoh Americas Corporation. All rights reserved. iPad is a trademark of Apple��Inc., registered in the U.S. and other countries. All other referenced product names are the trademarks of their respective companies. \"Our�research�has shown that people who want to work outside the office fear they will lose connection with their organizations and become irrelevant,\" said Matt Sakauchi, Vice President, Visual Communications Group, Ricoh Americas Corporation. \"The P3000 and the Unified Communication System Apps close this gap between the worker and the organization, giving workers and other participants the business-quality, face-to-face experience they want - anywhere at any time.\"
\"The P3000 is a game-changing product and is a perfect example of how our VidyoWorks platform can simplify enterprise grade business communications and workflow,\" said Ofer Shapiro, CEO and co-founder of Vidyo. \"This innovative service is another example of how our platform can drive industry changing cloud-based services and open new markets previously not addressed by legacy video conferencing solutions.\"
The P3000 Unified Communication System is available today through Ricoh's direct sales force for a manufacturer's suggested retail price of \$2,200 (USD), plus a monthly subscription to a cloud service. The Ricoh Unified Communication System Apps, available for Windows�here�and iPad at the iTunes Store�, are included with the paid monthly subscription.